Get the nutrition you need to stay healthy during pregnancy. 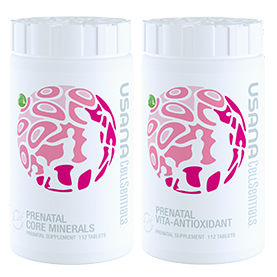 Also support the growth and development of your baby with Prenatal Vita Antioxidant and Prenatal Core Minerals. A healthy diet with plenty of fruits and vegetables will go a long way in providing the nutrition you and your baby need. Also taking a prenatal supplement can help ensure you get any essential nutrients you might miss. 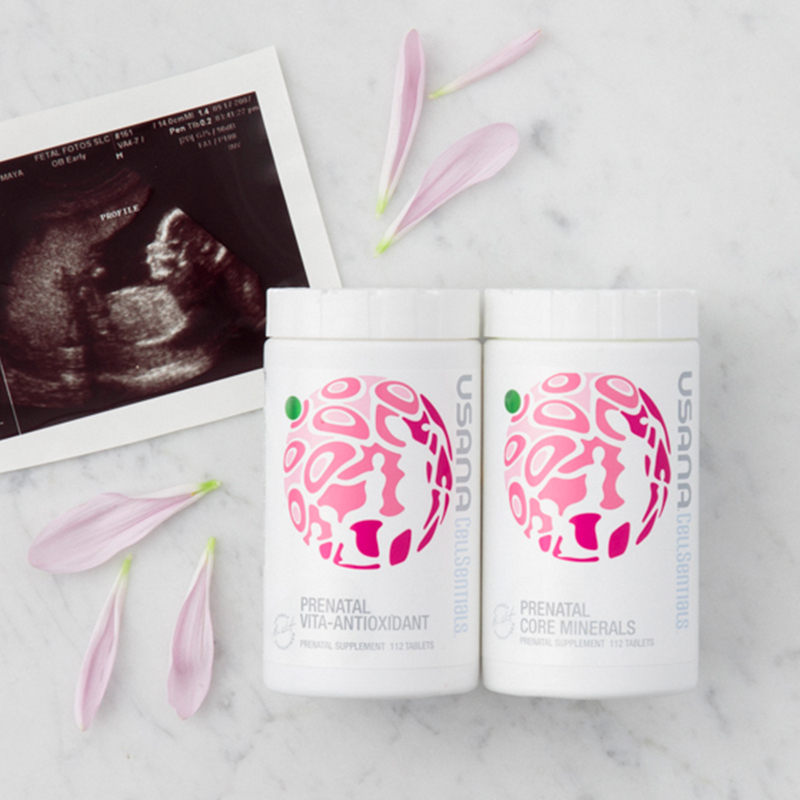 So, when should a mother-to-be start taking a prenatal supplement? Neural tube closure is critical for proper development of the brain and spinal cord. * Consuming healthful diets with adequate folate throughout childbearing years may reduce the risk of having a child with a birth defect of the brain or spinal cord. Sources of folate include fruits, vegetables, whole-grain products, fortified cereals, and dietary supplements. What are retinol activity equivalents (RAE)? You can get vitamin A from supplements in a couple different forms. Beta carotene or other carotenoids are considered the provitamin form, which means they must be converted to vitamin A in the body as needed. They are dietary precursors to retinal or retinol. However, sources like retinyl acetate are preformed vitamin A, which means they don’t need to be converted by the body. These preformed sources are much more potent. The standard of measure for vitamin A is retinol activity equivalents (RAE), which reflects vitamin A activity as retinol after conversion. Twelve mcg of beta carotene is equal to 1 mcg of retinol. Other carotenoids have a higher conversion ratio. Folic acid is one nutrient that is especially important to take prior to conception for normal neurological development. * Healthful diets with adequate folate may reduce a woman’s risk of having a child with a brain or spinal cord birth defect. What are dietary folate equivalents (DFEs)? Folic acid is a water-soluble B vitamin that converts to folate in the body. 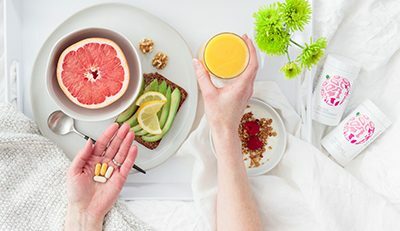 The NIH Food and Nutrition Board developed DFEs listed on supplement facts labels to reflect the higher bioavailability of folic acid than that of folate from food. One microgram DFE is equal to .6 mcg of folic acid from a supplement consumed with food. 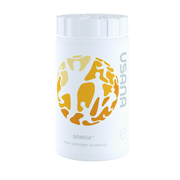 Biotin: Prenatal Vita Antioxidant is an excellent source of biotin. The rapidly dividing cells of the developing fetus require biotin to aid in regulating healthy cellular responses. There are a few additional supplements to consider taking while you are pregnant. Making sure you eat plenty of dairy products plus your Prenatal CellSentials may help you meet your daily needs for calcium, magnesium, and vitamin D. However, you might consider adding a separate supplement with these nutrients. Calcium is quite large as an ingredient, so a separate supplement is generally required to deliver the advanced amounts most women want. And as mentioned above, doses of up to 100 mcg of vitamin D have been shown to support positive pregnancy outcomes, so you could still safely add another 50 mg on top of the Prenatal Vita Antioxidant. 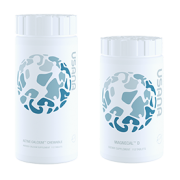 Check out USANA’s Active Calcium Chewable for a calcium supplement that’s easy on the stomach, or MagneCal D for a product with balanced levels of magnesium and calcium plus more vitamin D.
Some women also find Digestive Enzyme helps support healthy digestion during pregnancy. Adults take two (2) tablets twice daily, preferably with food. 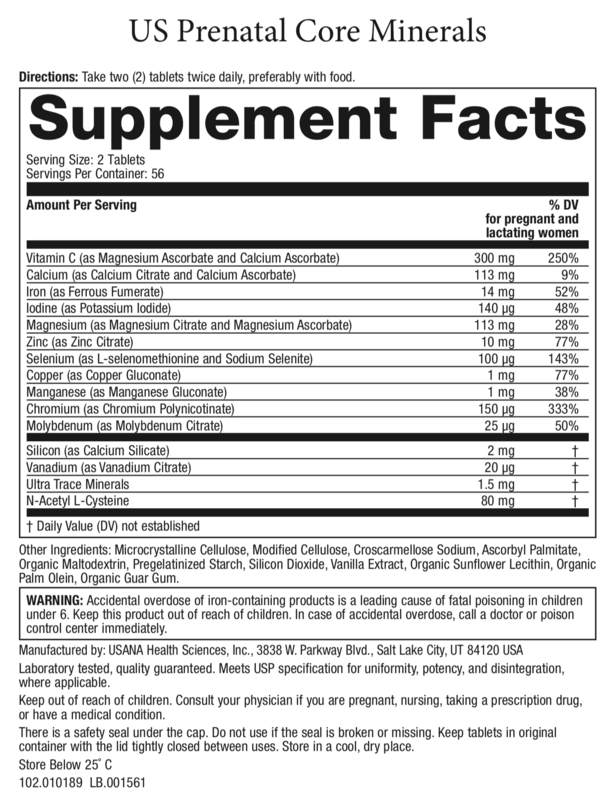 Why don’t the Prenatal CellSentials contain potassium? You won’t find potassium (or phosphorus, sodium, or chloride) in the Prenatal CellSentials because most women get plenty from their diet. Patelarou E, et al. 2011. Association between biomarker-quantified antioxidant status during pregnancy and infancy and allergic disease during early childhood: a systematic review. Nut Rev 69(11): 627-641. Bath S, Steer C, Golding J, Emmett P, Rayman MP. Maternal iodine status during pregnancy and the impact on cognitive outcomes in the offspring. 2011. Proceedings of the Nutrition Society 70(OCE6): E386. Zimmermann MB. The adverse effects of mild-to-moderate iodine deficiency during pregnancy and childhood: a review. Thyroid 2007;17 (9): 829–35. Yip R. Signi cance of an abnormally low or high hemoglobin concentration during pregnancy: special consideration of iron nutrition. Am J Clin Nutr. Jul 2000;72(1 Suppl):272S-279S. Mannion CA, Lindop RJ. Vitamin/mineral supplements and calcium-based antacids increase maternal calcium intake. J Am Coll Nutr. 2009 Aug;28(4):362-8. Institute of Medicine. Nutrition during pregnancy: weight gain and nutrient supplements. Washington, DC: National Academy Press; 1990. Hibbard BM (August 1964). “The role of folic acid in pregnancy”. An International Journal of Obstetrics and Gynaecology 71 (4): 529–42. Khayat S, Fanaei H, Ghanbarzehi A. 2017. Minerals in Pregnancy and Lactation: A Review Article. J Clin Diagn Res 11(9): QE01-05. Centers for Disease Control and Prevention. Spina bifida and anencephaly before and after folic acid mandate–United States, 1995-1996 and 1999-2000. MMWR Morb Mortal Wkly Rep. May 2004;53(17):362-5. U.S. Preventive Services Task Force. Folic acid for the prevention of neural tube defects: U.S. Preventive Services Task Force recommendation statement. Ann Intern Med. 2009 May 5;150(9):626-31. Evans MI, Llurba E, Landsberger EJ, et al. Impact of folic acid fortification in the United States: markedly diminished high maternal serum alpha-fetoprotein values. Obstet Gynecol. Mar 2004;103(3):474-9. Ladipo OA. 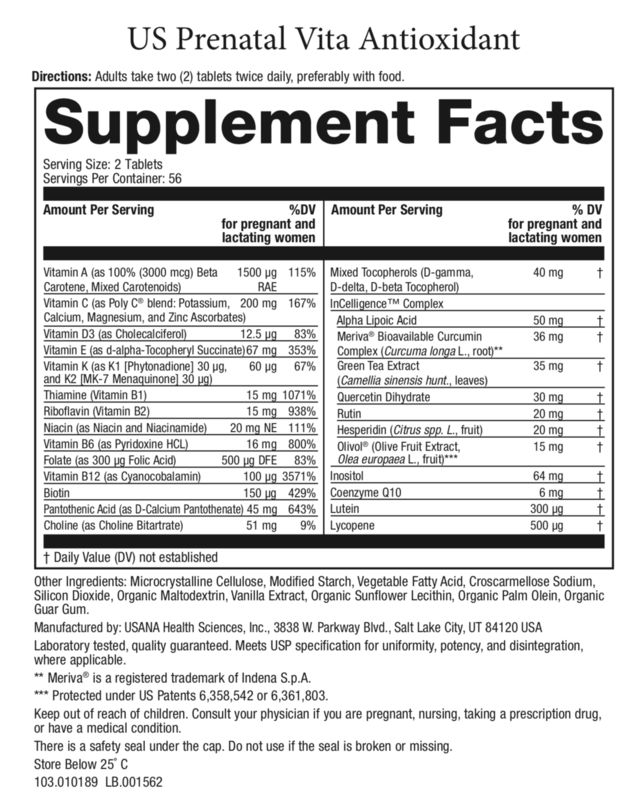 Nutrition in pregnancy: mineral and vitamin supplements. Am J Clin Nutr. Jul 2000;72(1 Suppl):280S-290S. Mock DM, Stadler DD, Stratton SL, Mock NI. Biotin status assessed longitudinally in pregnant women. J Nutr. 1997 May;127(5):710-6. Grune T, Ross AC, Stahl W, Tang G, Thurnham D, Yin SA, Biesalski HK. Beta-carotene is an important vitamin A source for humans. J Nutr. 2010 Dec;140(12):2268S-2285S. Shah PS, Ohlsson A, Knowledge Synthesis Group on Determinants of Low Birth Weight and Preterm Births. Effects of prenatal multimicronutrient supplementation on pregnancy outcomes: a meta-analysis. CMAJ: Canadian Medical Association Journal 2009; 180(12): E99-E108. Kovacs CS. Vitamin D in pregnancy and lactation: maternal, fetal, and neonatal outcomes from human and animal studies. Am J Clin Nutr. 2008 Aug;88(2):520S-528S. Mock DM, Quirk JG, Mock NI. Marginal biotin deficiency during normal pregnancy. Am J Clin Nutr. 2002 Feb;75(2):295-9. Maden M. Vitamin A and the developing embryo. Postgrad Med J 2001;77:489-491. Zile MH. Function of vitamin A in vertebrate embryonic development. J Nutr. 2001 Mar;131(3):705-8. Smith SM, Dickman ED, Power SC, Lancman J. Retinoids and their receptors in vertebrate embryogenesis. J Nutr. 1998 Feb;128(2 Suppl):467S-470S. Zile MH. Vitamin A and embryonic development: an overview. J Nutr. 1998 Feb;128(2 Suppl):455S-458S. Gernand AD, Simhan HN, Klebanoff MA, Bodnar LM. 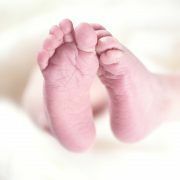 Maternal serum 25-hydroxyvitamin d and measures of newborn and placental weight in a U.S. Multicenter cohort study. J Clin Endocrinol Metab. 2013 Jan;98(1):398-404. Duhig K, Chappell LC, Shennan AH. 2016. Oxidative stress in pregnancy and reproduction. Obstet Med 9(3): 113-6. Mokhtari V, et al. 2017. 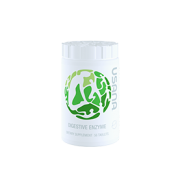 A Review on Various Uses of N-Acetyl Cysteine. Cell J 19(1): 11-17. Sharma JB, et al. 2006. Oxidative stress markers and antioxidant levels in normal pregnancy and pre-eclampsia. Int Jour Gyn Obst 94(1): 23-27. Amin AF, Shaaban OM, Bediawy MA. 2008. N-acetyl cysteine for treatment of recurrent… Reprod Biomed Online 17(5): 722-6. Hollis B, et al. 2011. Vitamin D supplementation during pregnancy: double-blind, randomized clinical trial of safety and effectiveness. Jour Bone Min Res 26(10): 2341-2357. Mossin MH, Aaby JB, Dalgård C, Lykkedegn S, Christesen HT, Bilenberg N. Inverse associations between cord vitamin D and attention deficit hyperactivity disorder symptoms: A child cohort study. Aust N Z J Psychiatry. 2016. Morales E, Julvez J, Torrent M, et al. Vitamin D in Pregnancy and Attention Deficit Hyperactivity Disorder-like Symptoms in Childhood. Epidemiology. 2015;26(4):458-65. March KM, Chen NN, Karakochuk CD, et al. Maternal vitamin D₃ supplementation at 50 μg/d protects against low serum 25-hydroxyvitamin D in infants at 8 wk of age: a randomized controlled trial of 3 doses of vitamin D beginning in gestation and continued in lactation. Am J Clin Nutr. 2015;102(2):402-10. Javaid MK, et al. 2006. Maternal vitamin D status during pregnancy and childhood bone mass at age 9 years: a longitudinal study. Lancet 367(9504): 36-43. Trüeb R. 2016. Serum biotin levels in women complaining of hair loss. Int J Trich 8(2): 73-77. Surén P, Roth C, Bresnahan M, et al. Association between maternal use of folic acid supplements and risk of… JAMA. 2013 Feb 13;309(6):570-7. El-Heis S, Crozier SR, Robinson SM, Harvey NC, Cooper C, Inskip HM. 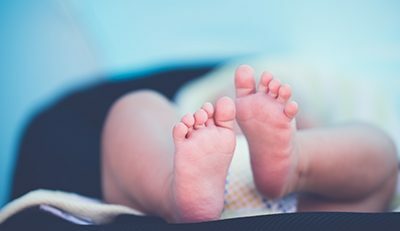 Higher maternal serum concentrations of nicotinamide and related metabolites in late pregnancy are associated with a lower risk of offspring atopic eczema at age 12 months. Clin Exp Allergy. 2016 Oct;46(10):1337-43. Zeisel S, da Costa K. 2009. Choline: an essential nutrient for public health. Nut Rev 67(11): 615-623. Caudill MA. 2010. Pre- and postnatal health: evidence of increased choline needs. J Am Diet Assoc 110(8): 1198-206. Leung AM, Pearce EN, Braverman LE. Iodine content of prenatal multivitamins in the United States. N Engl J Med. 2009;360(9):939-40. Asemi Z, Karamali M, Jamilian M, et al. Magnesium supplementation affects metabolic status and pregnancy outcomes in gestational diabetes: a randomized, double-blind, placebo-controlled trial. Am J Clin Nutr. 2015;102(1):222-9. Markhus MW, Skotheim S, Graff IE, et al. Low omega-3 index in pregnancy is a possible biological risk factor for postpartum depression. PLoS ONE. 2013;8(7):e67617. Innis S. 2008. Essential n−3 fatty acids in pregnant women and early visual acuity maturation in term infants. Am J Clin Nut 87(3): 548-557. Olsen S, et al. 2008. Fish oil intake compared with olive oil intake in late pregnancy and asthma in the offspring: 16 y of registry-based follow-up from a randomized controlled trial. Am J Clin Nut 88(1): 167-175. 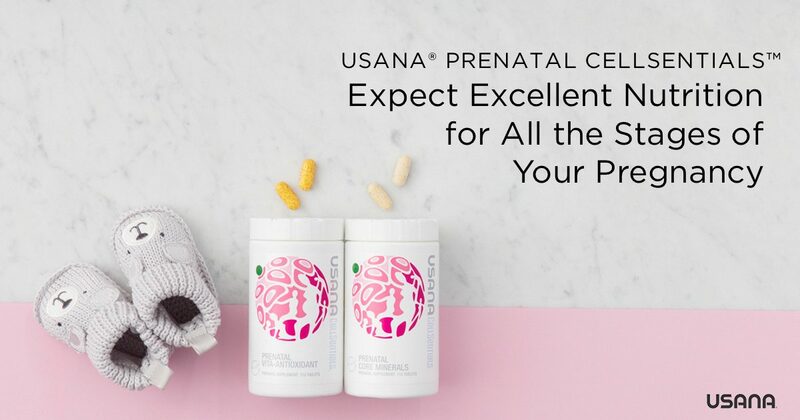 See which USANA products are generally safe to use when you’re pregnant or nursing. Always check with your doctor to make sure that these products are appropriate for your pregnancy. 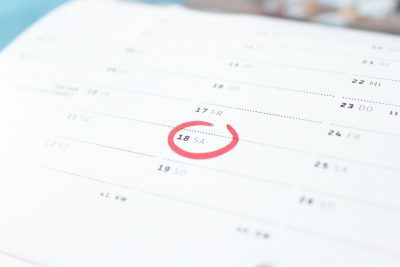 This study reinforces the concern that waiting until pregnancy is confirmed may be too late for nutritional intervention to benefit many pregnancy outcomes.